With a stay at Hotel Royalty in Pune, you'll be within a 10-minute drive of Fergusson College and The Pavillion. Featured amenities include a business center, dry cleaning/laundry services, and a 24-hour front desk. Free self parking is available onsite. When you stay at Sariska Tiger Camp Resort in Alwar, you'll be 13 minutes by car from Sariska Tiger Reserve and National Park. Free self parking is available onsite. 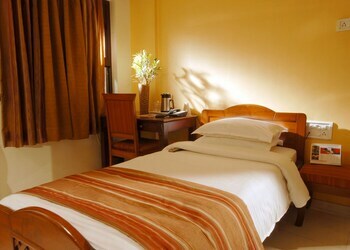 Located in Manali, Hotel Snow Princess is within a 15-minute drive of Vashist Springs and Mall Road. A shuttle from the hotel to the airport is provided for a surcharge (available on request). Located in Kumarakom, Tharavadu Heritage Home is on the waterfront, within a 15-minute drive of Vembanad Lake and Kumarakom Bird Sanctuary.